Expanded Queen Bed Size Feather Bed 66 in. x 80 in. Feather beds are hard to buy in special sizes. Fine Web Stores has been lucky enough to find a small feather bed manufacturer in the United States that builds special sizes for us! Our feather beds are approximately five inches tall when fluffed up. They are generously filled with 90% feathers and 10% down. The outside cover of the feather bed, or shell is composed of a white feather proof ticking of 233 threads per square inch feather bed fabric. 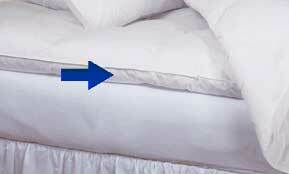 The baffles of the feather bed run side to side, 20 to 30 inches apart. Feather beds are designed to just lay on top of a mattress. There are no straps or attachments. Gravity does the work. When I asked a fine older sales lady that makes feather beds and such her life, how the feather bed stays where it is supposed to stay she said, "it just does." Some manufacturers do not suggest washing their feather beds. These generously sized feather beds are manufactured exclusively for FineWebStores.com. Feather beds are tightly packed for shipping. When you receive you feather bed, fluff it up and allow several hours for it to recover their full loft. In addition, being sealed in plastic packaging sometimes causes the scent of these natural products to concentrate to a disagreeable level. A few hours of airing usually removes the odor. These Expanded Queen Size Feather Bed Toppers measure 66" x 80" and are 5" thick.